A cinema is a place where people gather together to watch motion pictures. However, it took around ten years from when motion picture films were ‘invented’ to the emergence of such dedicated venues. The first films to be made available to the public were seen via the Edison Kinetoscope peepshow in 1894, and other peepshow devices such as the Mutoscope were common for the next few years, showing films (or films on card) to solitary viewers. 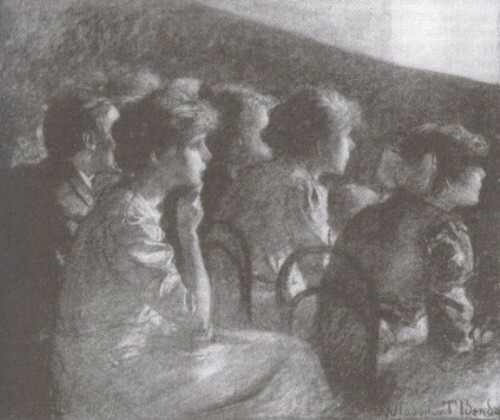 Projected film was intended for an audience, and after a few preliminary screenings in America, France and Germany in 1895, public film shows rapidly spread across the world during 1896-97. These films were generally no more than a minute long, were shown in groups of around 20 to 30 minutes in length, and frequently formed just one part of larger programmes, such as a variety theatre show. Such shows drew a largely metropolitan, theatre-going crowd, but films were also being taken on the road by travelling showmen, and exhibited in halls, fairgrounds, amusement parks and other areas of public entertainment, where they began to attract a predominantly working class audience. As films grew longer, to around 20 minutes on average, they started to make up the entirety of the programme and it became logical to have auditoria that featured films alone. Rudimentarily fitted out, and priced cheaply to attract a poor audience in large numbers, such venues first appeared in the United States around 1904/5, where they were popularly known as nickelodeons, after the price charged for entry. These venues were often converted shops, with rows of benches for seats, a reputation for being unhygenic, and with great appeal for immigrant audiences. The idea spread rapidly to the UK – where they were often called bioscopes or electric theatres – and across Europe. Film shows at this period were generally around 30-40 minutes in length, presented to an audience anywhere between 100-500, often (though not always) with live music to accompany the film. In some venues songs with illustrated slides were used to break up the programme. Many of these cinemas or movie theatres operated on a continuous show policy, so that anyone could drop in at any time, and stay for as long as they liked. This policy of being open to all at any time, together with low prices, a strong appeal for children and women (for whom other forms of entertainment were not always socially acceptable) and the attraction of the films themselves turned cinema-going into a social and economic phenomenon. Cinema was an easy place of escape that became a welcome habit for millions. Over the 1910s cinema took over the world. At first film production was led by Europe, particularly France, but over the decade American films became increasingly dominant in all markets, driven by the great appeal of star names and the power of the studios that were now congregating in Hollywood, California. Films because longer, with the feature film (one occupying the majority of the cinema programme) becoming all the more common after 1914, while weekly serials such as The Perils of Pauline served as strong incentive for people to make picturegoing into regular habit. A twice-weekly trip to the cinema became common, and it was usually a short trip because cinemas were now to be found everywhere. There were around 3,600 in the UK and 12,800 in the USA by 1912. The era of converted shops was over, and now the venues were increasingly purpose built, and designed more luxuriously, imitating theatre fittings. The largest cinemas could hold 3,000 or more people. Film shows attracted much adverse comment from some quarters, with social commentators variously complaining about the influence of films on the young, the unhealthy nature of the venues, the unchecked mixing of the sexes, and the fire hazard that some of the more ramshackle venues undoubtedly represented. Calls for censorship of films were common, and part of the cinema trade’s emphasis on grander, more salubrious venues was to attract more of a middle-class audience. Cinema audiences throughout the 1920s became more socially diverse, appealing to most levels of society while still keeping prices low enough to attract the poor and the young, whose enthusiasm for the medium had laid the foundations for the industry and whose support remained essential. In general the drive towards conformity and theatre-like presentation led to a quietening of audiences, in the West at least. Audiences which previously talked to each other or at the figures on the screen in cinema’s first years were now expected to sit quietly and enjoy the show. In other countries, such as India, cinemas retained more of their role as a social space, where people came as much to meet each other as see the films. India also had many travelling showmen who continued to take films to village audiences. Cinemas were now to be found worldwide, frequently American film dominating the programmes so that stars such as Charlie Chaplin, Mary Pickford and Douglas Fairbanks were followed across the globe, recognisable to almost anyone. No other mass-medium had the same global spread and influence that the cinema now enjoyed. At the end of the 1920s the widespread introduction of sound to films had a seismic effect on production methods, and a sizeable one on film presentation (many musicians who had supplied live music for films were put out of work), while audiences remained much the same. Silent films persisted for some years into the 1930s in some countries, notably China and Japan. The international nature of films was reduced to a degree, as it was no longer possible simply to change the titles of a film into another language to make it appreciable in any country. American films’ dominance of English-speaking territories remained. The major US theatre chains were often connected to US production studios: Paramount, Warner Bros., Loew’s/MGM, Twentieth Century-Fox and RKO. The cinema programme was firmly established, along with the audience habit (in Western countries at least) of a usual one or two visits to the cinema per week per person. An evening’s entertainment at the cinema might comprise a second feature, a main feature, a newsreel, a cartoon, and advertising films. Documentary and educational films were often restricted to non-theatrical venues, meaning halls, clubs, schools etc., though short subjects of various kinds – such as travel films – did form part of the general programme. In the 1930s colour films, in the form of Technicolor, started to become more common (in the silent era, films were often colour tinted but actual colour processes were rare and rudimentary in their effects compared to later developments). Cinemagoing reached a peak in popularity during the Second World War and the years immediately following. The number of movie theatres in America reached a peak of 18,631 in 1948 with an average weekly attendance of 90,000,000. A reduction in other forms of leisure activities during wartime helped boost cinema’s attendance figures, particularly in Europe. In 1947 France had 424,000,000 annual cinema admissions; Germany had 459,600,000. The UK reached an all-time peak with 1,635,000,000 admissions in 1946. From this highpoint, cinema audiences began to fall away, chiefly on account of the growing appeal and availability of television throughout the 1950s, which drew audiences to the smaller screen with a greater range of entertainment in the living rooms. Though there was a rise in audiences for some European countries in the 1950s, the general trend was downwards, with the US cinema audience falling by half in a decade from its 1948 peak. Film companies responded with technical features that television could not reproduce, particularly colour, widescreen images and 3D. Other innovations in the US included drive-in cinemas and the placing of cinemas within shopping centres. Such developments extended the range of cinematic production and exhibition, but did not halt the general decline. The audience demographic was also changing in Western countries. There were increased efforts made throughout the 1960s to attract young audiences, who were keen to going out on a regular basis for their entertainments, while their parents stayed at home to watch television, only going to the cinema on an occasional basis. But with the general fall in audiences came a fall in the number of screens (there were 18,631 screens in the USA in 1948, falling to 13,480 – including drive-ins – by 1969) and a marked decline in the actual cinema experience, with smaller auditoria, plainer presentation and general cost-cutting all too apparent. Assorted developments over the 1970s and 80s changed the nature of cinemagoing. Technical advances such as Dolby noise reduction improved the quality of the aural experience, while IMAX large-screen presentations built on earlier developments such as Cinerama showed how a specialised visual treat experience could be provided outside conventional auditoria. The introduction of multi-screen, or multiplex cinemas in the 1980s, offering a choice of film rather than the one programme, helped turn around the fall in cinema audiences, coinciding with a series of popular spectacles such as Star Wars and E.T., which benefited from advances in special effects. At the same time, cinema faced new competition from the rapid spread of home video, which pointed the way to a further breakdown in how people chose to view motion pictures. Choice has been extended further by the development of digital technologies, even as these have enhanced – or at least significantly influenced – the nature of cinema production. Digital technology has encouraged studios to take special effects to new heights (through such titles as Terminator 2 and Jurassic Park), with the cinema promoted as the optimum space for enjoying such spectacles to the full. Digital production has enabled extraordinary advances in animation (Toy Story, Wall-E) and boosted the appeal of 3D on account of the steadier image that can be provided (Avatar, The Life of Pi). At the same time digital has increased audience choice, by extending the range of platforms on which films can be consumed. Films can be enjoyed on computer screens, phones, tablets and on home cinema devices, as television screens grow ever larger, shrinking the difference between the domestic and the public film screening. The internet has created an alternative distribution model, with ongoing battles between rights-owners seeking to control access to content and many among a digitally-savvy public who try to bypass such controls through torrent sites and peer-to-peer sharing. Meanwhile, the medium that drove cinema for over a hundred years, film, is on the way out, being rapidly superseded by digital projection across the world. Cinema remains a place where people gather together to see films, but it is but one link in an exhibition chain that encompasses television, personal devices, home video formats, airline screenings and more. Nevertheless, the cinema experience is still a distinctive one, and one that audiences still seek out in their millions. Cinema is a social experience: where you are, who you are with, what you do in this social space, are as important as – or integral to – the enjoyment and understanding of what is projected on the screen. Its essential nature endures.